The McCord Museum in Montreal has announced the winner of their "Houdini Last Show Poster Contest." 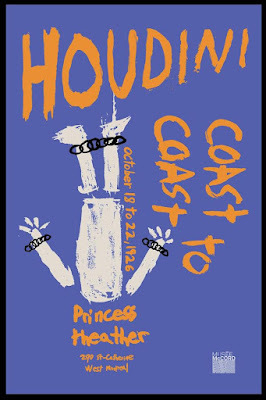 Entrants were asked to create a poster for Houdini's last show at the Princess Theater in Montreal. Samuel Clairoux won the prize of the jury and the public's favorite prize for his poster below. Come discover the posters by our "Houdini: The Last Show" contest finalists, exhibited at the Museum from December 8, 2017 to January 7, 2018! It is your last chance to visit the exhibition "Illusions: The Art of Magic" before it comes to an end. For more information visit the McCord Museum website or Facebook. I would have picked the middle entry from the list of finalists as the winner. That was my selection as well. Yes, I agree that the winning poster should have been the middle one of the runners-up. The winning poster doesn’t appear to have that “Houdini” look to it, or 1920’s, Art Deco elements are missing. Things we associate with Houdini. And the misspelled word! It’s hard to believe that poster won. What was the target age group for the contest? Kids? Any age? As far as I can tell, the winner was selected based on how many "Likes" it got on Facebook. Maybe not the best way to decide this. I hadn't noticed the misspelling until now. Goodness. Which makes one wonder about the people running the McCord Museum. Any of those three finalists would have have been much better choices. The spelling was fixed before the contest ended. It seems they used an image of the initial entry here. The error was likely due to the poster being submitted in two languages, as it only appeared on the first English version. I think it was the best and I’m very glad it won! Facebook is the perfect place for public’s favorite votes, and the jury simply agreed. I designed the (orange) middle poster in the finalist selection above, and its nice to see the poster getting some positive reactions here. I’ve entered contests before and usually don’t take the results personally but this one was different for some reason. I don’t dislike the winning poster, I like some elements in it but I don’t know why the results still have me scratching my head. In putting together my poster there was a conscious effort to find a balance that referenced the older vintage posters while giving it a more modern look and feel. The size they asked for (24" x 36") had a lot to do with my design decisions. The winning poster chose to go with an impactful punch on first glance (and lacks interest for me upon looking closer) while my submission tried to create a main image that maybe had a softer punch on first glance, but filled in details and little rewards to discover when taking a closer look. - The error was likely due to the poster being submitted in two languages, as it only appeared on the first English version. The contest only gave English text to use, and asked to only submit the work in English. It seems it was a mistake made by the designer. Fixed afterwards, as it was displayed without the mistake when printed and framed in the finalist lineup at the museum. - I think it was the best and I’m very glad it won! 1 - What is it about the winning poster you though captured the essence of Houdini and was able to pay homage to the language of the old vintage posters while also bringing it into a more modern context? What did you personally like about it and were do you think it has flaws (unless you think it's a 100% pristine perfect poster). - Facebook is the perfect place for public’s favorite votes, and the jury simply agreed. I ended up feeling a bit weird about the Facebook audience voting portion (and chose not to participate) as I find these kinds of things are more about how popular the person is on Facebook and how many Facebook friends he or she has that can be campaigned to come and vote. You can’t deny that the majority of people will vote for the friends piece no questions asked more than ponder about the context and quality. It makes it, in my opinion, a popularity contest of the individual who did it, not so much about the work itself. I know I just sound like a sore loser about this point. Maybe I am. An interesting way it could have been presented would have been to ask the museum visitors who had just went through the exhibition, after immersing themselves in that world to vote. Put it at the end of the exhibition, make it less about voting for your friend and more about an unbiased view of the work itself. There is also a sense of irony that an exhibition that celebrated and displayed massive posters but presented the public contest portion on a computer screen … the size of mini postcards instead of people being able to see the original 24 x 36 poster size when judging. Did the jury vote on them in the same way, or after seeing them printed out at the intended size? I guess it brings up an interesting question – maybe a poster SHOULD be AS impactful at 3 inches then at 36 inches. Maybe not. What are your thoughts on this? - and the jury simply agreed. And here is where you’re right - there was a jury of specialists and the winner was chosen. Fair is fair, that’s how the game is played. I fully realize much of this will sound petty on my part and reflect that I am a sore loser about it all. Maybe I am. I wouldn’t usually write this kind of thing, but for some reason this time I did. p.s. I actually have a few extra posters here if anyone likes it enough to want one.